Where did all these lake trout come from? Why does the park want them gone? How has the lake trout’s presence in Yellowstone Lake affected other organisms, such as the iconic cutthroat trout? Early park managers looked at this situation and saw a waste. Fishing was a big tourist industry, then as now, and in its early days it was unclear if the park would be able to attract enough visitors to remain economically viable. So, in the 1880s, the park began deliberately stocking fish in an effort to attract anglers. It worked. In 1889 and 1890, the Firehole River—the river that flows past Old Faithful—received brook trout (Salvelinus fontinalis), a species native to eastern North America. Rainbow trout (Oncorhynchus mykiss) from the West Coast states were introduced into the the Gibbon River. And Lewis and Shoshone Lakes, two deep bodies of water in the southern half of the park that both drain via the Lewis River to the Snake River, were stocked with brown trout (Salmo trutta) and lake trout (Salvelinus namaycush). Active stocking continued for decades. By 1955, more than 310 million fish—some native, many not—had been planted in Yellowstone waterways. While the park doesn’t stock any longer, we still see the effects of the stocking program today. How can the park justify its position on fishing? Arguments in favor of maintaining the status quo seems to fall into three main categories. The first, not often stated aloud, is scientifically feeble but economically solid: angling is a long-standing Yellowstone tradition, and the park has become a world-famous fly-fishing destination. The second reason is a nominally scientific one. Anglers can play a significant role in data collection about what fish are out there. By returning the survey cards that rangers issue with every permit, visitors who come to Yellowstone to fish provide valuable information to NPS biologists about fish populations throughout the park. The third justification distills to “do no harm”: native species of fish, like the cutthroat, are catch-and-release only. In a perfect world, angling would not be detrimental to the native fish species. In the real world, unfortunately, hooked fish sometimes are injured in a way that renders them unlikely to survive for long after release. The park tries to counter this by requiring that anglers use only barbless hooks. The only fish you can keep, in Yellowstone, are non-native species. The idea here seems to be that anglers can remove non-natives that compete with native fish. Yet there are waters in which some non-natives must also be released. In the Firehole, for example, non-native rainbow and brown trout are catch-and-release only, per park fishing regulations. Brown trout aren’t even a North American fish; they are native to Europe. But they are also a favored sport fish, and apparently that’s enough to afford them some level of protection. The argument seems to be that, since the Firehole above Firehole Falls was historically free of fish, the presence of rainbows and browns is minimally detrimental. So why all the fuss over lake trout? They have been in the park for a long time—just as long as the rainbows and browns in the Firehole and the Gibbon. Lake trout are deep-water dwellers. Also known as mackinaw, they are native to deep, cold bodies of water like the Great Lakes. They grow to enormous sizes and are voracious predators. Introducing them into Lewis and Shoshone Lakes had effects on the aquatic ecosystems there, I am sure, but since those waters were historically fishless, the lake trout at least didn’t have an impact on other fish species. They existed there in relative isolation for almost a hundred years. That all changed in the mid-1980s, when lake trout were illegally transported into Yellowstone Lake. What did their arrival in waters with native fish mean? Check back this weekend to find out, in part II of Something’s Fishy in Yellowstone Lake. Looking across south Shoshone Lake towards the Red Mountains. Shoshone Lake is the largest backcountry lake in the lower 48 states (i.e., the largest lake not accessible by car). Though historically fishless, Shoshone Lake now is home to brook, brown, and lake trout. It is connected to Lewis Lake by the Lewis River Channel. 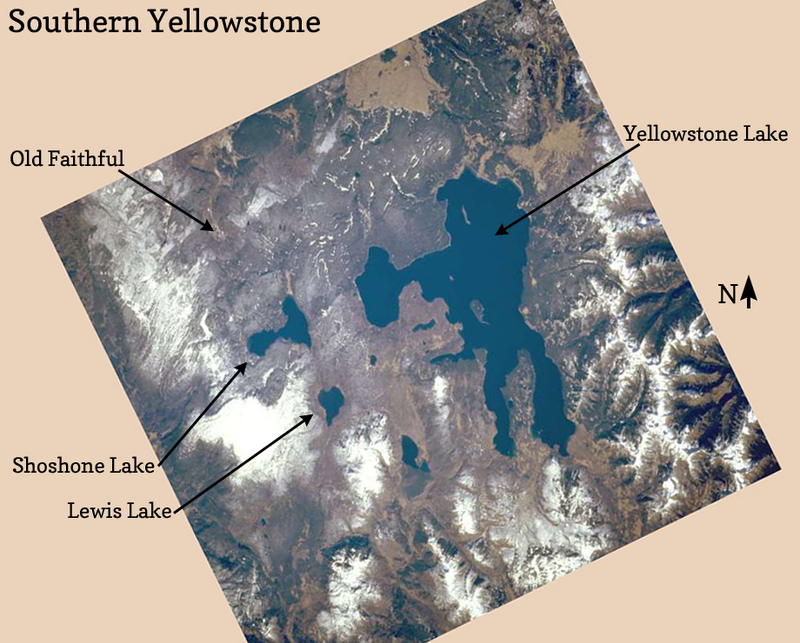 One of these bodies of water is almost certainly the source of the lake trout that were illegally introduced into Yellowstone Lake in the 1980s. Fascinating! And I love the map.